Cheesecake is the dessert we order most often when dining out. Since I started making cheesecakes in the slow cooker, I make them much more frequently; so we can Just Say No to expensive desserts at the restaurant and go home to homemade cheesecake! It is pumpkin season, so pumpkin cheesecake was in order. But I like vanilla so much I thought I'd compromise with a pumpkin swirl cheesecake. Of course, as usual, I just made it up as I went along. I thought 1/2 cup of pumpkin puree mixed into 3/4 cup of the cheesecake batter would be about right for the swirl. Took a stab at the spice amounts; couldn't go by taste because I do not eat anything with raw eggs in it. Turned out well! Do you think this might make a change from pumpkin pie on your autumn celebration menus? Or an addition? Think I'll have just a tiny sliver of each! 1 Butter bottom and sides of a 7-inch springform pan with the softened butter. Cut a circle of parchment paper to fit the pan, press it in the buttered pan, then turn it over and press it into place. 2 Combine crumbs, and melted butter until the mixture comes together. If you used a food processor to make the crumbs, you can mix the crust in it as well. If you used your fingers or the rolling pin/plastic bag method to make the crumbs, you can mix the crust with a fork in a small bowl. Press the crumb mixture evenly and firmly over the bottom of the pan. Note: The ginger cookies I used would have been impossible to crush without a food processor! 3 With electric mixer on medium speed, mix cream cheese, sugar and vanilla until perfectly smooth, about 2 minutes. Scrape the bowl and beaters/paddle. Add eggs, one at a time, mixing well after each addition. On low speed, mix in sour cream just until well combined. Remove 3/4 cup of the cheesecake batter; set aside. Pour half the remaining batter into the prepared pan. Note: Don't get in a hurry like I did and not allow enough time for your cream cheese to come to room temperature and soften, or you end up with little chunks of cream cheese throughout the batter. Even if it all smooths out as it bakes, I don't like it! Do as I say, not as I do! 4 Stir together the reserved 3/4 cup of cheesecake batter and the pumpkin puree and spices until thoroughly combined. Place spoonfuls of the pumpkin batter on top of the filling in the pan; pour the remaining half of the batter into the pan. Place spoonfuls of the remaining pumpkin batter on top of the filling in the pan; cut through batter several times with a knife to make swirls (being careful not to disturb the crust). 5 Place rack in bottom of cooker, and add water to just below the rack (that's about 2 1/2 cups in the Cuisinart MSC-600 Multicooker). Set the cheesecake on the rack. Cover the slow cooker with a triple layer of paper towels and the lid. (The paper towels will prevent condensation falling from the lid onto your cheesecake.) Set to Slow Cook on High for 2 hours; do not lift lid. Turn off the heat and let stand for 1 hour; do not lift lid until the hour is up. 6 Remove the lid and paper towels, and remove cheesecake to wire rack. Carefully run a knife around the edge of the cheesecake; cool for 1 hour. Run the knife around the edge again and remove the sides of the pan. Cover and chill for at least 6 hours (or up to 3 days) before serving. Hi there! What a lovely blog, and judging by the first few post I've encounter it is aptly named. 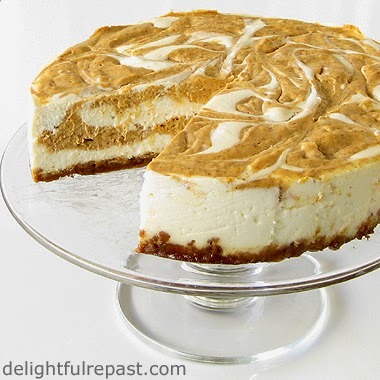 This pumpkin swirl cheesecake looks delicious. I may just give this a try for Thanksgiving. Have a wonderful day! That looks simply delicious, Jean. And I think I mentioned before that I gave away the slow cooker that would have fit my springform pan. :-((( Probably just as well. I'd most likely be making and eating cheesecake way too often. It's my favorite dessert! The Great Scot doesn't really care for pumpkin, but does love cheesecake. Guess what I'll be making this weekend! Thank you so much, magnoliasntea! Which reminds me, this is sooo good with a nice cup of tea! Jacqueline, you and the Great Scot can share. He can eat the vanilla bites and leave the pumpkin bites for you! Thank you so much, Jean, for this recipe. My sis and I are so happy you shared! I really should take up cooking/baking. But then a man has to know his limitations...meanwhile, the dishes you feature always look so GOOD! Mildred, my pleasure. I hope you both like it as much as we do! Do let me know how it turns out for you. Mike, thank you so much! This recipe is really quite easy, you just might surprise yourself! This looks fabulous and a great new way to use my slow cooker. I'm a pumpkin fan. Thanks, Carol! I'm having fun with the slow cooker since I finally got one. This pumpkin swirl cheesecake looks scrumptious. I love anything with pumpkin at this time of year. Thanks for sharing. Sheri, thanks! I hope you'll give it a try soon. And the whole thing made in a slow cooker, no less. Impressive! Joanne, thank you so much! This looks like a great dessert option for Thanksgiving! 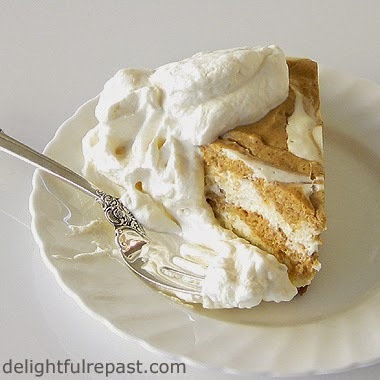 I love the idea of cheesecake and pumpkin swirled together....thanks for sharing! That looks so delicious! My hunger pains are really kicking in! Thank you, Jodee! Glad you like it! Bethany, thanks! I just had the last piece. Froze a couple pieces to see how well that works because it's always good to be able to make things ahead. Another gorgeous slow cooker cheesecake from you, Jean. I love the beautiful swirls. Thanks, Angie. I just love swirls! Swirls of anything! Cheesecake is one of my all time favorites and I love pumpkin pie too. I'd probably make it in addition to the pie, just because I love both so much! Do you think this recipe would work in a conventional oven since I don't have a slow cooker? Preheat oven to 325 or 350. Wrap the outside of the springform pan completely with heavy-duty aluminum foil. Set the pan inside a larger pan (8x8x2-inch, 13x9x2-inch) and place in oven. Use a teakettle to fill outer pan with hot water halfway up the sides of the springform pan. Bake for 1 hour. Turn off oven and let the cheesecake sit in its waterbath in the oven for 1 hour. Then remove from oven and proceed as directed in my recipe. Do try it and tell me how it went! Interesting way to create a pumpkin cheesecake. Looks just scrumptious. Thanks, Linda! The slow cooker makes it foolproof. VP Jeani!…no, not vice-president (you would be president). VP stands for Vanilla-Pumpkin. An inspired concept on your part. So you are a VP genie. Looks delish! Confession: I have never exercised my imagination into pumpkin swirl anything, but the photo you poster look so good that I corrected the omission. My imagination tells me this is in A-1 dessert. 5 cleavers! Aah, the coveted 5-cleavers award, Sully! Thank you, thank you. I think you should definitely make this. If you don't own a slow cooker, you can make it the water-bath-in-oven way I gave instructions for a couple comments back. I am looking for new pumpkin recipes for Thanksgiving and I even have a pie pumpkin that I am seriously considering baking and using the puree for this recipe. Thank you for your visit, so nice to meet you too! Jemma, thank you! Do let me know how it turns out for you! Greg, I think my husband would agree with you. He's all about texture and most pumpkin pies, except mine, are not right for him. Nicole, thank you. And no worries, I'm sure yours will come out just as pretty! Thanks, Amy! I hope you will try it soon. Who knew you could make cheesecake in a slow cooker? What a great idea and it's dessert without heating the kitchen. It's summer down here and I will do anything not to turn on the oven. Maureen, I just hate heating up the kitchen more during hot weather! So I'm doing all sorts of crazy things with the slow cooker! Thanks so much for visiting my owl post and leaving your wonderful comment. Carletta, thank you! Autumn is my favorite time of year. Beautiful, cool and great for baking! Jean, this is such a beautiful cheesecake...it looks amazing! Cheesecake is one of my favorite desserts...pinning and sharing! Thanks so much for sharing it with us at Foodie Fridays! Michelle, thank you so much! I seem to be getting addicted to cheesecake! Saving your recipe to try it out one day, thank you for sharing and I wish you a great week ahead. Helene, thank you! I hope you will try it and, of course, tell me how it turned out for you. Thank YOU, April! And I'm so glad you like this recipe!